This post is sponsored by Wayfair I was compensated for this post but all opinions are mine. Thank you for supporting the brands that support Pars Caeli. From school to practice to Church and road trips, my family and I spend a lot of time in our car. We plan our journeys carefully, but I always want to be ready for any unexpected adventures we can seize at a given opportunity! Of course, we also have those times when we're stuck in traffic or come upon an emergency, and our car is like a second home and safe haven. Thanks to my friends at Wayfair, I'm sharing my top tips to maximize car travel and make any occasion out of the ordinary. From bumps and bruises to emergencies, it's a smart idea to keep a First Aid kit handy (even in the back of your car). This simple First Aid Kit is all you need. Less major emergencies like dead electronic devices can be avoided by keeping an extra charger for yours and the kids devices in the car. Keeping a few empty, reusable water bottles in the car makes sense and keeps our budget in check during frequent stops. Flashlights or head lamps get more use that you might expect! Between practices or on a beautiful sunny afternoon, spontaneous picnicking is highly encouraged. We keep a picnic blanket always ready in the back! We also keep a set of camping chairs stashed for t-ball and soccer games. This is a little over-the-top, but during warmer months, we keep a simple tent in the back. I think the possibility and the thrill of camping wherever you are is just awesome. Keep some read along CDs/books or audiobooks always at the ready. Don't forget about the fun that you don't have to pack like car games!! I Spy, The Alphabet Game (finding words on signs that start with each letter of the alphabet), word association, 20 Questions, the license plate game. I also recommend printing off these two games - one for kids and one for teens to help pass long trips. When all else fails, have a book, a few CDs, and if your vehicle uses them, DVDs at the ready to entertain. Crayons, a tablet of paper, and scissors have saved us from tantrums and boredom more than I ever imagined. We use the scissors all the time to cut off tags from new purchases that just have to be worn right away! These playing cards are maps, too! They're perfect for road tripping! It's not fancy, but extra trash bags, tissues, napkins, disposable silverware, and straws are always, always helpful! Last but not least, pack your sense of humor. What road trip or fun day of errands would be complete without some jokes!! Pack my lunchbox jokes for 180 illustrated cards and keep them in the side box. What do you recommend to make the most of every car ride? Adding good news to your feed every Tuesday! Follow Pars Caeli on Facebook. "What happened in Paris, Mommy? Why do they keep using the word "terrorist" on TV?" I didn't want to explain a terrorist to my inquisitive 10-year old. I don't know how to, and I desperately wish that we lived in a world where that conversation never needed to happen. But, she's heard the word, and she wants her mother to explain why these horrific events happened to innocent people. "How could someone do that, Mommy?" I have no good explanation, though in her presence, I tried to seem brave and knowledgeable, so that perhaps the immensity of it all would not overshadow her. "Fear is what they want to evoke," I told her. "It's hard not to be scared. We will mourn, and we will pray, and we will do our best to be peaceful people in our corner of the world. And when we recognize the fear coming up, we will feel it, and find the good. Because good always prevails, always. I am sure of that. And God will strengthen us when we feel helpless and alone. He gave us each other." A portion of every Do Good product goes to The Sweet Pea Foundation which assists children and their families during hospital stays. In an effort to inform and explain, the media covers images and retells stories of threats, attacks, violence, war, and tragedy. All relevant information, all needing to be shared, all compounding for a bleak look at the state of the world. And despite all that - no, maybe in the face of all that - I see the world that is overflowing with goodness. The poet, Gerard Manley Hopkins said it like this, "The world is charged with the grandeur of God." It is in the kindnesses that individuals extend to one another, the grand sweeping gestures that impact thousands, and the hopeful discoveries that lead us to believe in a different future. All of these are also happening every day, and in every place. And these acts of goodness need to be shared. In our very small corner of the world, we're trying to add more goodness to the world. In the shop, a portion of the profits of every "Do Good" product (children's tees, women's tees, and letterpress print) go to help hospitalized children and families through The Sweet Pea Foundation. And I know that you all are doing this kind of thing in your lives, too!! You're finding ways to stay open to joy, to reach out to those on the margins, and to give to those in need. And we need to share that your good work with the world, lest we all be overcome by the sad news around us and misled to believe that the tragic is all there is. In honor of Giving Tuesday, this day designated to give to the non-profit of your choosing, we will be sharing goodness every Tuesday over on Facebook (you have to see some of the amazing stories happening there today!!). Let's make every Tuesday one for giving. Tag any of your stories or photos on Twitter or IG with the #goodnesstrending hashtag, and we'll share them on Tuesdays. I challenge you to share these stories with your children and your spouses and your parents and neighbors. Let's remember that goodness is trending. Goodness prevails. Perhaps if we can focus on the goodness before us, and share that joy with each other, we might dissipate the darkness, while giving one another a safe hand to hold into the future. What's something hopeful, something good, happening for you? "Those lunchbox cards are helping me feel like a great mom and giving me the opportunity to communicate with (my children) mid-day which I really really like. Thank you." Don't quit your daydream! How one mom took her lunchbox notes from paper bags to product launch. This summer was a whirlwind. A major dream came true (with a whole lot of work behind it), and I opened my online shop. I also spent focused time creating precious childhood memories with my three kids in something I called the 18 Summers Challenge (we really only get 18 summers with our kids!! Weep). And something even better than my wildest dreams came to life. In collaboration with The Land of Nod, I created launched my first product - a collection of lunchbox jokes! I present the Lunchtime LOL Notes. When my oldest daughter went off to full-day Kindergarten, I, like so many parents, added a note to her lunch. After hearing from my daughter about quiet lunch times, I decided to add a joke and doodle to my messages. Teachers and lunch helpers would read them to the table, and everyone got a kick out the silly pictures and corny jokes. As I searched daily to find something sweet to draw, I wondered if other parents would find it helpful to have an easy way to add something extra to their child's lunch like I was. I started sharing these notes on Instagram and hearing from other moms and teachers who would reuse them with their kids! And it was so exciting to see where in the world and in what ways these notes were used! I loved the idea that I could help other parents connect (in the middle of the day or on a long drive or in a doctor’s office) with their children. As more and more people commented and shared these illustrated jokes, I began to wonder if I could take them to the next level. Should I produce these on my site? Or furthermore, find a brand who might want to bring this idea to their audience. I first mapped out what I wanted the lunchbox notes to be: an entire pack ready for 180 days of the school year for parents, cards that had a blank back for parent's personal notes, and special jokes for certain holidays and times of the year. How do you make your daydream a reality? A story of one mom entrepreneur and her pack of lunchbox jokes, now sold at The Land of Nod. With these parameters in mind, I thought through my pie-in-the-sky favorite paper, children's, and card companies. Which ones best fit my own aesthetic and hope for these fun notes? The Land of Nod kept coming to the top of my list. I've purchased many pieces from their collections throughout the years for my children, and I find their products smart, well made, and the right mix of whimsy and art. Blogging throughout the years, I had developed a mother-designer friendship with Danielle, Creative Director for the company. I worked up my biggest entrepreneurial boost of confidence and sent her an email to pitch the idea of lunchbox notes. And she didn't say no. In fact, she said yes. And months later I found myself illustrating for not only a brand that I love, but for people who help me make other moms and dads feel awesome. And handle my creation with the kind of positivity and wit that I'd hoped. And it's kind of awesome. This is not the norm for product creation or working with brands, but every once in a while the heavens align and dreams come true. And there's just no reason why the same couldn't happen to you. Keep dreaming and taking big girl leaps to make those dreams come true. And get yourself some Lunchtime LOL Notes! They've already sold out once so get your order in soon!! Do you remember making crayon scratch offs as a child? Enjoy the same fun with your children with firework art. Crayon scratch off art is a fun project that shows off the bright colors that lie just below the dark, top layer. 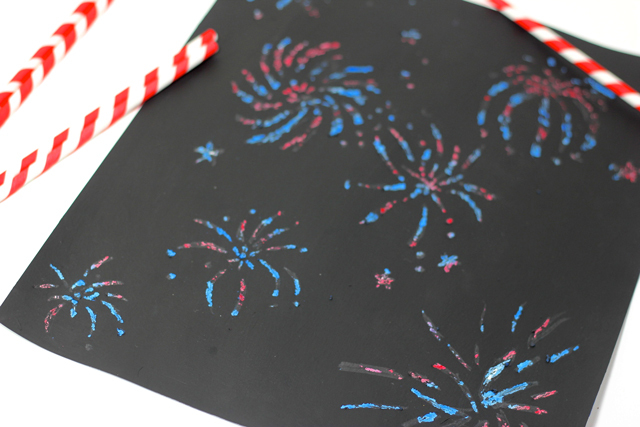 The contrast of the bright and dark make a great backdrop for firework art! Did you make these as a child? I remember pressing so hard against a piece of white paper with my crayons, covering every last bit of white space. And then grabbing the black crayon to cover over it all. Begin by covering your entire paper with color. We wanted to create a firework sky perfect for the fourth of July so we made a spiral of blue and red. Be sure to go all the way to the edges. Next, paint on an even coat of the black. Let it dry completely. To be sure that the black is a solid, deep tone, add on another coat of black paint and let it dry. This whole process took less than an hour. Once dry, take your scraping tool and draw fireworks of various shapes and sizes. Be sure to leave enough black on the paper to illustrate the night sky. Add in bits of sparkle and stars that shine through the shapes that you create. Keep in mind that sometimes the paint will require a few strokes to remove completely. And some will remain on the poster board, making a scattered fizzle like we all love in our favorite fireworks! These would be a great craft to set up for the kids at your July 4th celebrations! Fireworks before it even gets dark! P.S. If you're joining in the 18 Summers Challenge, and making the most out of this summer with your children, join us tomorrow as we make some marbelized paper from shaving cream and food coloring.